Held in the East Bay with easy parking and near BART. Includes tour of the Locus magazine offices. Registration is now closed! Thank you, and look forward to seeing you there! In Part I of a two-part class, author Gail Carriger talks about what it means to be “gothic” and how to manipulate gothic tropes when writing your own commercial fiction. Did you know most genre fiction was born out of gothic literature? Science fiction, fantasy, horror, mystery, and romance novels all borrow tropes and archetypes from the gothics. Perhaps most intimately connected of all is steampunk. In Part II, Gail talks about how to bring depth of characterization to your writing using comedy. From protagonists to sidekicks to three sentence walk-ons, she’ll discuss what makes a character funny, and how to provide readers with fictional people they love. She will also discuss other ways to inject humor into your work. Gail is an experienced lecturer and not afraid to make a fool of herself. A Q&A session about Gail’s writing, career, the publishing industry, or anything else that strikes your fancy will follow. 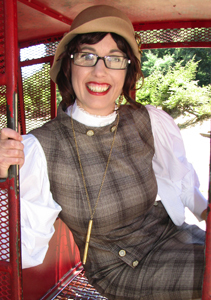 Gail Carriger writes urbane fantasies mixed with steampunk comedies of manners. Her books include the Parasol Protectorate, Custard Protocol, Supernatural Society, and Delightfully Deadly series for adults, and the Finishing School series for young adults. She has been published in eighteen different languages, has been on the USA Today and Locus lists multiple times, and the New York Times list thirteen times (on seven different lists: Mass Market, Hardcover, eBook, Combined Print & eBook, Young Adult, Children’s Series, and Manga at #1). Gail has been nominated for the John W. Campbell Award, and received the Steampunk Chronicle’s Reader’s Choice Award in YA, the Prix Julia Verlanger and Elbakin Award from French readers, and a Starburner Award in Literature for her “contributions to the steampunk community.” She was once an archaeologist and is overly fond of shoes, octopuses, and tea. Locus Writers Workshops: Locus has been co-running a writing workshop in Seattle around the Locus Awards Weekend for the past few years and is excited to bring the class to the Bay Area. Past instructors include Connie Willis, Stephen Graham Jones, Paul Park, Christopher Barzak, and Daryl Gregory. Thinking of attending? Please do. We support diversity! We encourage people of color, women, people with disabilities, older people, and lesbian, gay, bisexual, and transgender people to apply. We welcome people of any gender identity or expression, ethnicity, race, sexual orientation, age, size, nationality, religion, culture, education level, and self-identification. Workshop location and other details will be emailed after registration. Workshop is in San Leandro, CA near BART. Additional questions? Please e-mail Locus.